The seminars, unlike the lectures, will not have many explanations and sometimes will only include graphic and/or visual material, assuming that the reader can make sense of it. However, in some cases, it could include audio explanations. The seminars will be running during 8 days (Universidad de Buenos Aires and Universidad de Quilmes) according to a especific timetable. Seminar – 'Cinema and History. 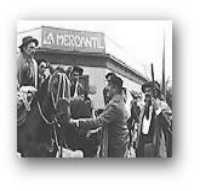 The case of La Patagonia Rebelde (1974)' (2007). A presentation, debate and exhibition of the classical movie from Hector Olivera took place on March 1st 2007 as part of an annual series of seminars of 'History on Film' at the University of Exeter. Since 1974 when the film was showed for the first time many historical aspects have been developed. In 2006, the film maker Eduardo Anguita made a documentary revisiting the film and Osvaldo Bayer's book upon which the film was partially grounded. Photo: Black and white frame from the film La Patagonia rebelde (1974), copyright. Seminar - ‘Land and Cinema. The Geographical Design of Space through Cinema’. Offered to the 2007 Society for Latin American Studies (SLAS) Conference, University of Newcastle-upon-Tyne, Newcastle. Four schemes to discuss about the issue. Seminar on 'The De-colonization of Latin American Studies and its Connections with American Studies' (2007). This seminar was of a project which aim was to make a comparison between the evolutions of American studies in European and within US against the evolution in the same places of the Latin American Studies.Seminar offered at the University of Exeter. Seminar on 'The notion of "Spatial Diaspora" and the Location of Knowledge' (2006). (Unpublished, English). This seminar was part of the project that lead to the publication of Geo-epistemology. Latin America and the Location of Knowledge (2009). Seminar on ‘La cartografía patagónica. La materia conceptual y la conceptualidad de la materia’ (2005). Seminar offered at the Conference ‘Patagonia. Myths and Realities’, Manchester University, September 2005. The texts are in Spanish and in PDF format. Hipótesis de trabajo. La cartografía (file of 28.37MB). In the academic present conditions within Western domain, in particular within Anglo-Saxon universities, sometime 'one off' seminars offer many advantage, starting by the fact that in many cases are offered by 'outsiders' of the institution. Seminars' environment also offer a degree of freedom that the present constrain of the standard syllabus do not allow. in this sense we can refer to a sort of 'culture of the seminar' like something positive and stimulating.